"China is one of the largest economic partners of Azerbaijan"
“China is one of the largest economic partners of Azerbaijan,” said Chairman of the Committee on Economic Policy, Industry and Entrepreneurship of Azerbaijan`s Parliament Ziyad Samadzade as he met with a delegation led by former Ambassador of the People's Republic of China to Ukraine, Poland and Kazakhstan Zhou Xiaopei. 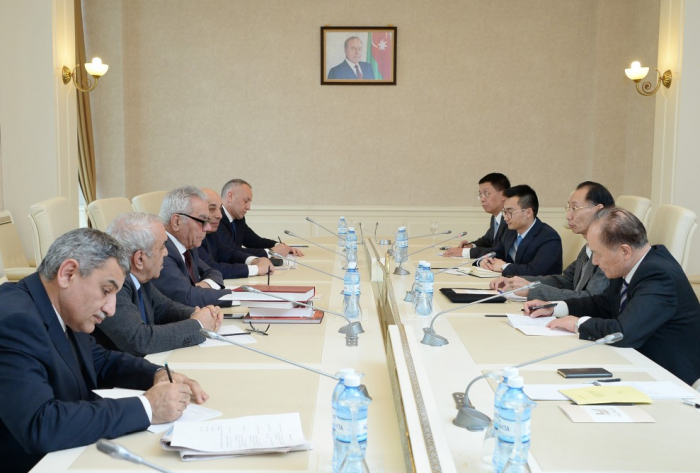 Samadzade noted that the Chinese relations with Azerbaijan are based on ancient historical roots. He said Azerbaijan supports "One Belt, One Road" initiative of the Government of China and believes that this project will contribute to global economic development. The chairman of the committee mentioned that the Azerbaijani Parliament has adopted a law on the Alat Free Economic Zone and a new port with higher cargo-handling capacity has been built in Baku. The sides also exchanged views on other aspects of the development of economic cooperation between the two countries.